Today it was brought to my attention that there are two dolphins, Hope and Destiny, being inhumanely confined in what could possibly be the worlds smallest dolphin tank located at, no other than, the TAIJI WHALE MUSEUM. These dolphins were first discovered by Ric O' Barry and Lincoln O' Barry in 2009 while in Taiji. The only difference between what they saw then, and what we see now, is that there were three dolphins being held in the tank in 2009. One has passed since then, and leaves the two. Suspected as a result from captivity, these two dolphins just float all day in a coma like state, simply having no room to do anything else. In May 2011 Brian Barnes filmed a video of what he called the "Fish Bowl". This shows documentation of the effect of the captivity in this tank, and just how small the tank is. It truly is a fish bowl. 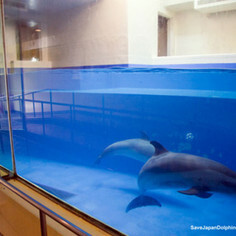 Please help get these two spotted dolphins out of this tank and into a larger home. PLEASE go sign the petition, and share it around as much as your heart can take. (Click Here) to sign the petition. Thank you.